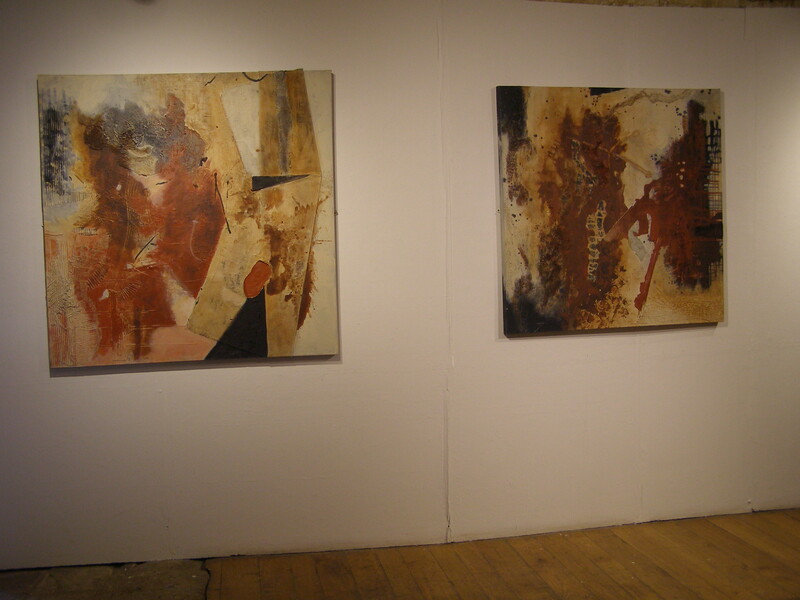 These paintings contain the duality of chance and choice, what in music John Cage talked about as ‘considered improvisation’. 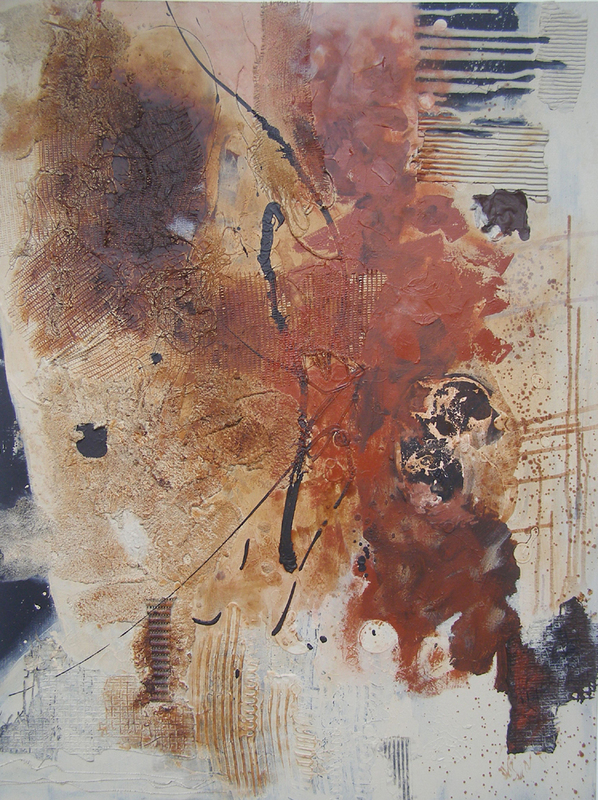 Nick has allowed us to witness a sensual engagement with material and is inspired by painters such as Burri, Tapies, Millares and Kiefer whom he refers to as ‘matter’ painters. There are forces in these works that complement and oppose, Nick uses edges to draw the eye away from the centre, evident in ‘Certain’ and ‘Expansive’, and often creates two opposing experiences within the same painting. 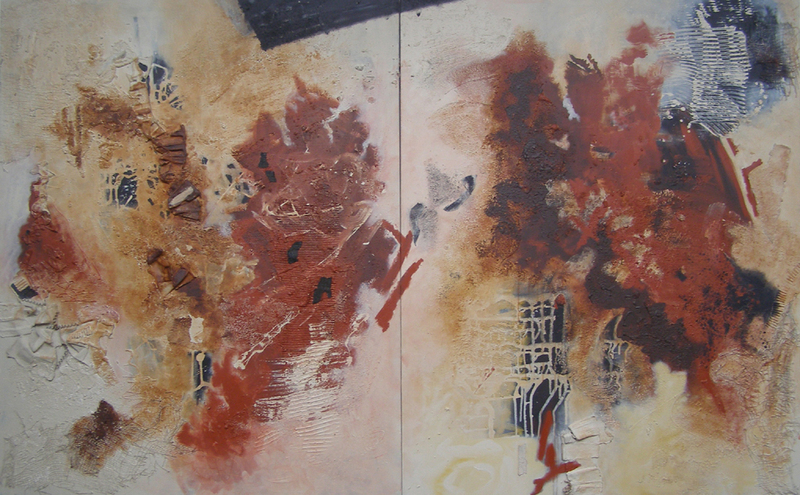 In ‘Jumpy’ for example the elemental, explosive, volcanic eruption of buff, Payne’s grey and red ochre on the left side is tempered by the diagonals leading to an area of architectural constructs. 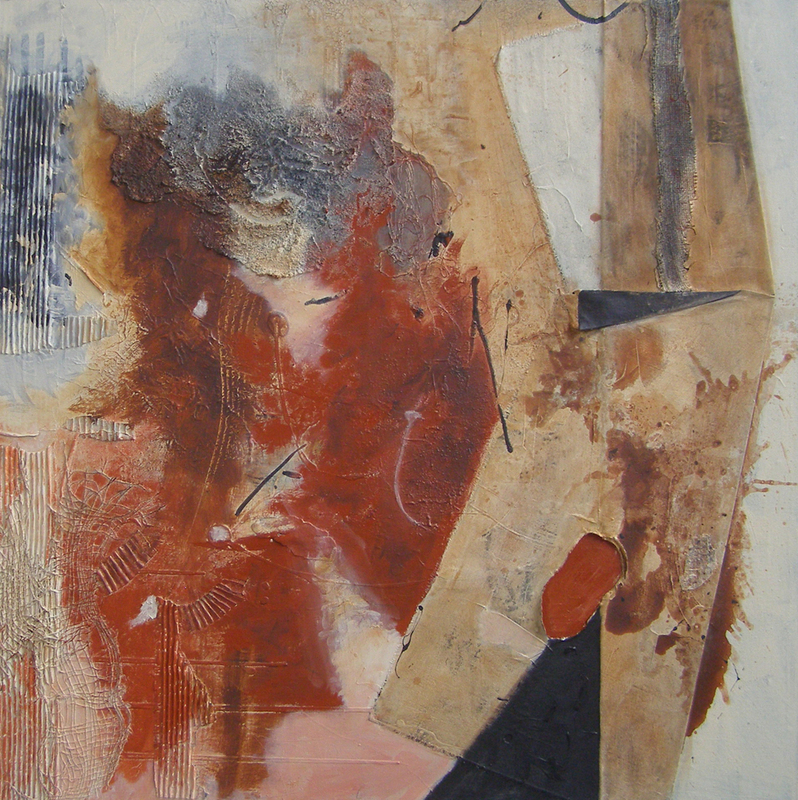 Similarly in ‘Cryptic’ the right hand side is occupied by graphic shapes and structures, triangle wedges and a rectangular like sheet of canvas stuck on with a raised oval hole, giving it a cubist collage feel, whereas the left is all weaving, shifting chaos. In ‘Breathless’, hung off square on the diagonal, there is a central broken band delineating two halves of the composition, with an explosion of scrim to the left and gestural painting to the right connected by horizontal marks taking the eye from one side to the other. 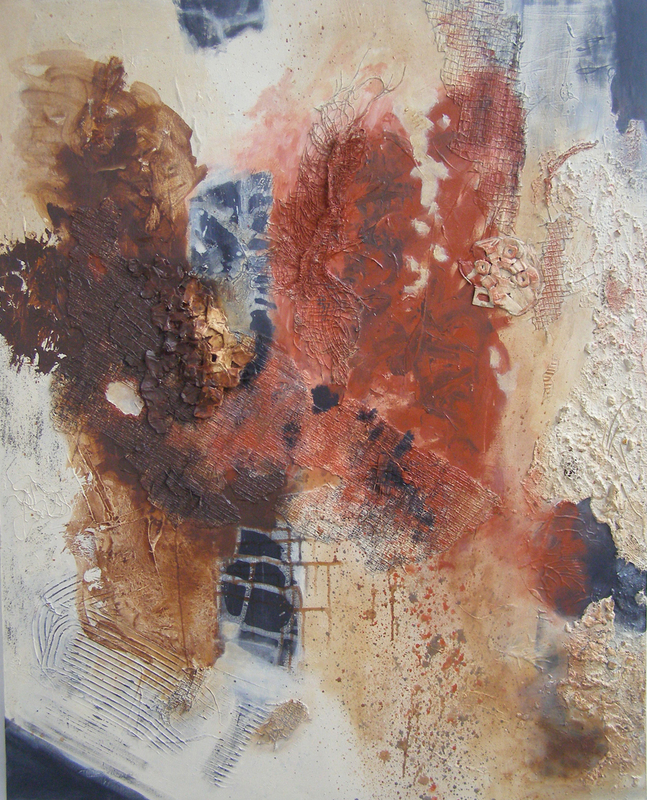 Nick’s work expresses opposing sensations throughout, dark/light, smooth/rough, fluid/caked, splattered/blended, chaos/structure, milky/sooty, painted/collaged, frontal/aerial, size/scale. 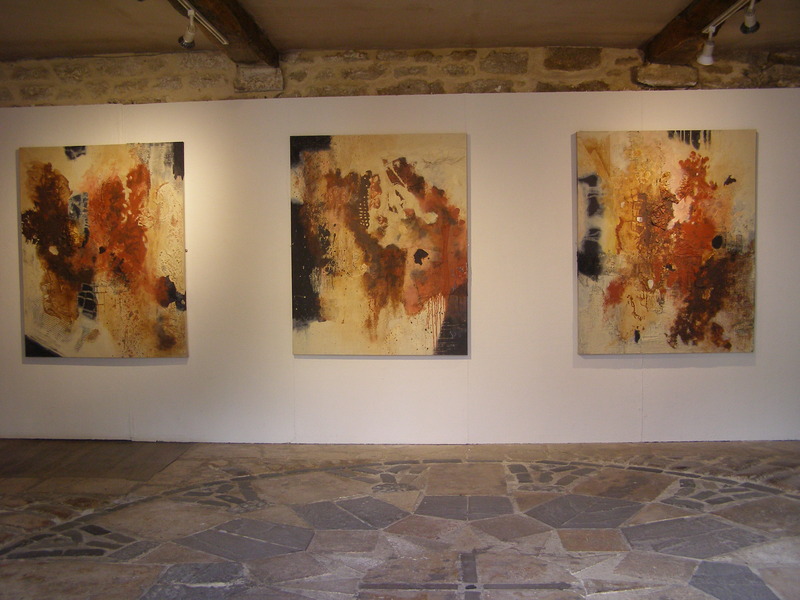 The exhibition can be taken in as a coherent whole as you walk into the space, largely due to the reduced, shared colour throughout, but the works reveal their individuality and invite close scrutiny to experience the complex layering and well handled integration of matter into the surface. There are areas of sensitive watery milkiness webbing their way across compacted dry Payne’s grey in contrast to inky spills and stripy drips over ashen chalky passages. There are craggy raised surfaces very evident in ‘Expansive’, ‘Pungent’ and ‘Discursive’, but also painted textures echoing the corrugated card and weave of the sacking used to activate the surface. During his talk Nick was explaining that after the ‘DarkLight’ series he had a period of improvising with buff, terracotta and black clay, responding to a need to work more ‘tactilely’, more directly with ‘stuff’. The objects he created became a kind of bridge between the two series and led to the expanding materiality of the new body of work in this exhibition. 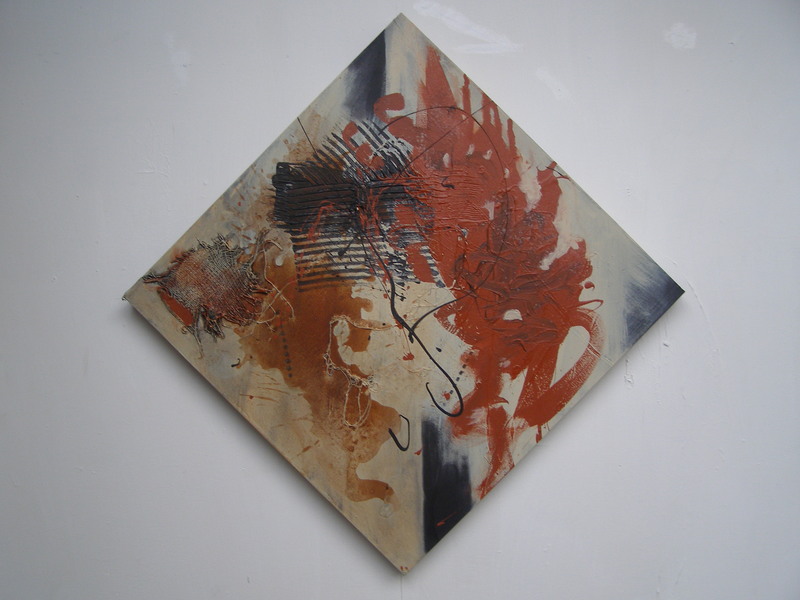 Each series of paintings contains a seed of an idea for the next, something discovered to build on and develop, a continuous shifting of material. Great review, Noela. It’s a shame I didn’t get to see any of Nick’s work during my recent visit. 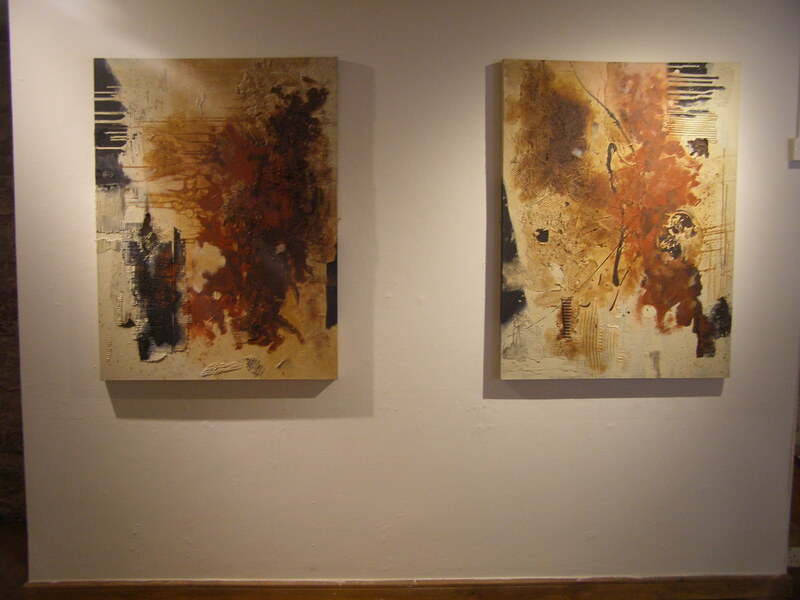 I did however see quite a lot of Tapies in Madrid, as well as some Keifers and Burris in the States last year. From what I can glean from reproductions, Nick’s work is operating in a very different way from those guys. His seem far less literal, in that the inclusion of “foreign” elements into the painting does not seem to be the beginning and the end of the story. The burnt sacks in Burri often seem to dominate and conjure up readings of his work that are too biographical. 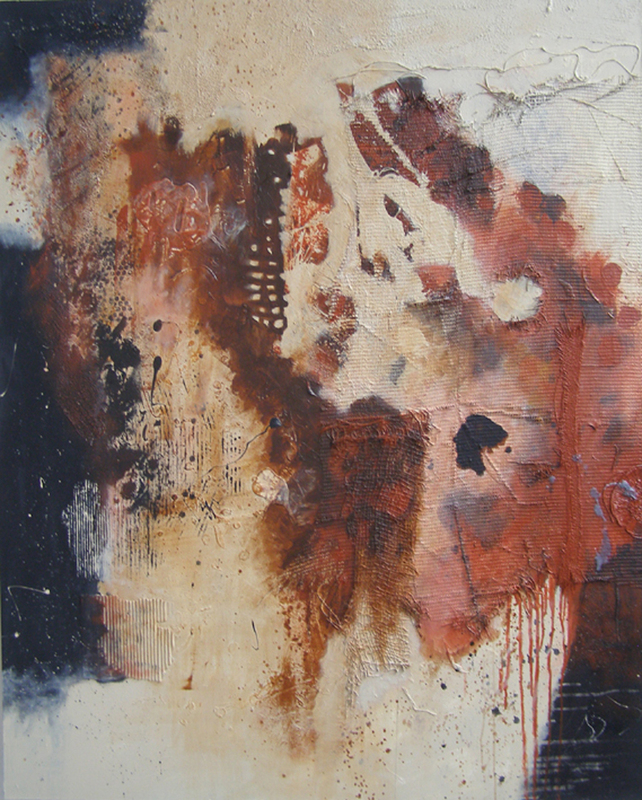 The crackle paintings inevitably mimic a dry riverbed. 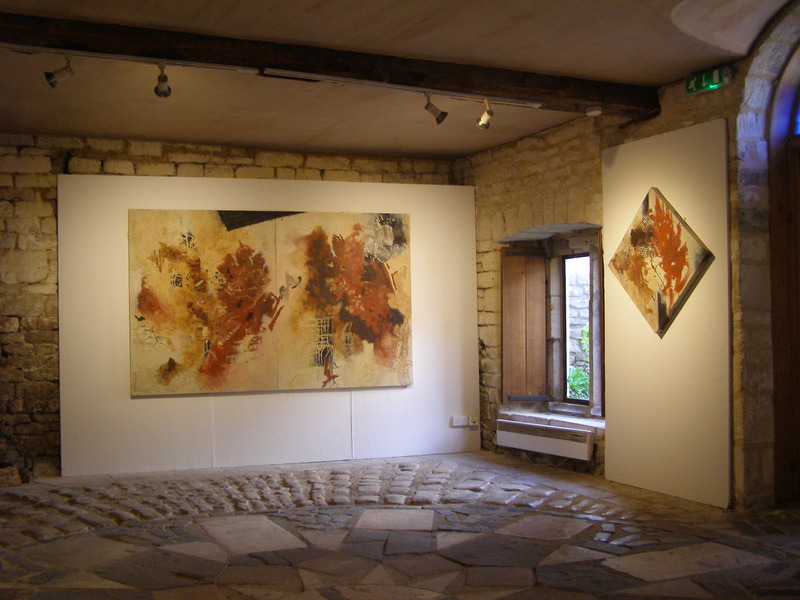 The cement like paint in Tapies becomes impenetrable and oppressive, like walls or pavement. There seems to be more play, more elements and more integration into the actual paintwork going on in Nick’s paintings, that seems to make them about more than what they are made of, bypassing the associations we give to particular materials. Thank you Harry, you are right, there is more at play in Nick’s paintings than the materials they are made of. He has managed to create a variety of visual experiences from a restricted palette and well integrated matter or ‘stuff ‘ as he calls it.